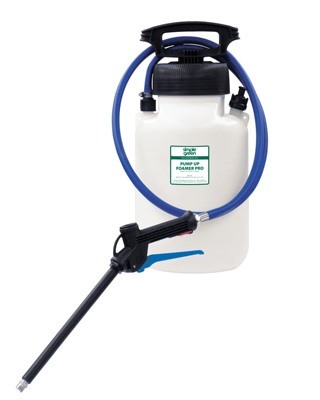 The Simple Green Pump-Up Foamer Pro is a portable foam applicator that combines the many advantages of foam cleaning with the familiar ease and portability of a typical pump-up sprayer. This professional model creates rich, clinging foam that adheres to surfaces longer, maximizing chemical effectiveness and reducing over-application. It features a heavy-duty, easy-grip trigger gun with 10" extension wand, 6' hose, a wide pattern stainless steel fan nozzle, and a locking latch for fast and precise application. Viton/Nitrile internal seals and o-rings provide resistance to acidic chemicals and the 1.5 U.S. gallon HDPE tank with UV inhibitor can withstand chemical temperatures up to 120°F. The durable manual pump can create up to 45 PSI, making it ideal for small or large jobs that require maximum portability.